Winemaker Rich Cushman was born and raised in Hood River, Oregon. After attending UC Davis from 1978-1980 and apprenticing in Germany, Rich returned to Oregon and spent the next 25 years in McMinnville raising a family and making wines for his private label, Viento and for other well known wineries in the Willamette Valley and Columbia Gorge AVAs. 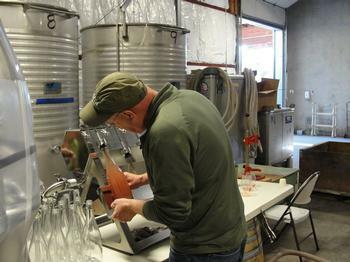 Rich and his family returned to Hood River’s Columbia Gorge Appellation in 2007 to make his limited production wines. The new Viento tasting room is immediately next to their vineyard, named appropriately— Columbia Gorge Vineyard, which Rich and friends planted in 1981 with Riesling, his favorite white grape.